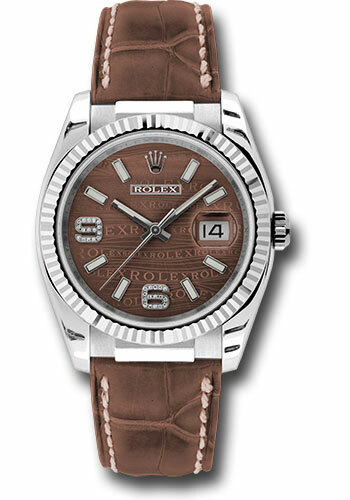 36mm 18K white gold case, fluted bezel, brown wave dial, diamond set 6 and 9 Arabic numerals, and brown leather strap with 18K white gold deployable clasp. 36mm 18K white gold case, fluted bezel, blue dial, stick hour markers, and blue leather strap with 18K white gold deployable clasp. 36mm 18K white gold case, fluted bezel, mother of pearl dial, diamond hour markers, and white leather strap with 18K white gold deployable clasp. 36mm 18K white gold case, fluted bezel, pink dial, stick hour markers, and brown leather strap with 18K white gold deployable clasp.